Most expensive childcare in London revealed – how does your borough fare? 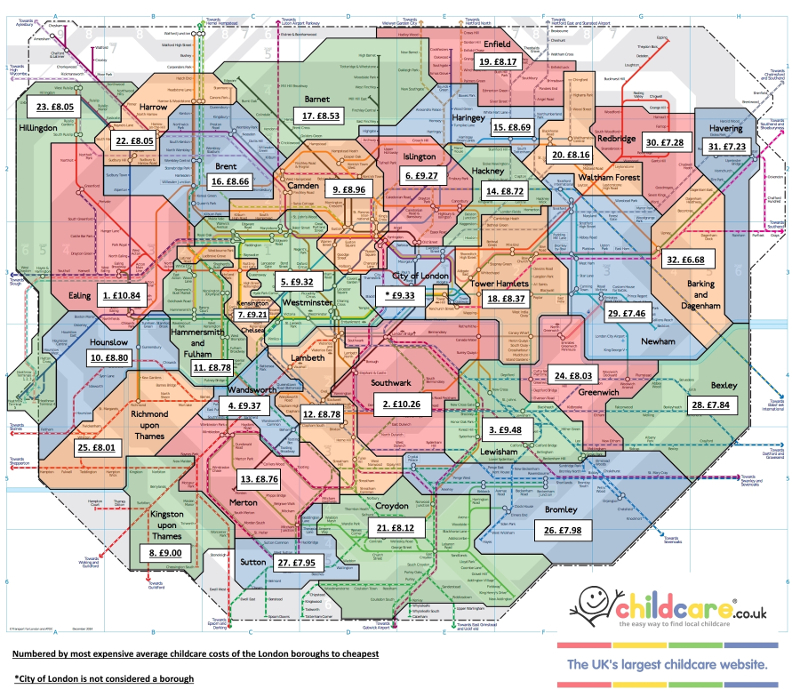 Have you ever wondered if childcare costs change based on where you live? Well, we’ve revealed which London boroughs are, on average, the most expensive for childcare services, so now you can find out! As you can see from our tube map graphic, Ealing sits well above the rest of the London boroughs followed by Southwark and Lewisham. Parents are paying, on average, nearly £5 per hour more for childcare. The most expensive service for all of the boroughs is Nannying, which is most expensive in Southwark, where some people are paying more than £16.39. We used our internal data to compare childcare costs in London and found that Ealing topped the list with the borough’s average hourly rate sitting at £10.84, more than 50% higher than the national average of £7.16. Barking & Dagenham came in as the least expensive borough. The most expensive average hourly rates for different childcare services in London are ranked: Nannying (£10.35), Babysitting (£10.18), Childminding (£7.11) followed by Day Nurseries (£6.16). For many parents childcare is a necessity which they can’t go without, and this data proves that some people are willing to pay premium prices for different childcare services. More than 300,000 London residents are actively searching for childcare through our website and mobile apps each month, and more than 120,000 childcare providers are searching for work. “I think it’s interesting to see how much childcare providers’ hourly rates change based on location. We have thousands of childcare providers across the UK and London prices are, as with most commodities and services, substantially higher.